Las Vegas —I’ve tried wireless earbuds before—they’re a pain. They’re not truly wireless; oh, they might connect to your device wirelessly, but the left and right buds are still connected to each other with a wire. And that wire gets tangled in your hair, your shirt, your bag…. They’re a nuisance. So when I spied HearNotes’ “WireFree” earbuds at the CES Unveiled event on Sunday, I wanted to know more. 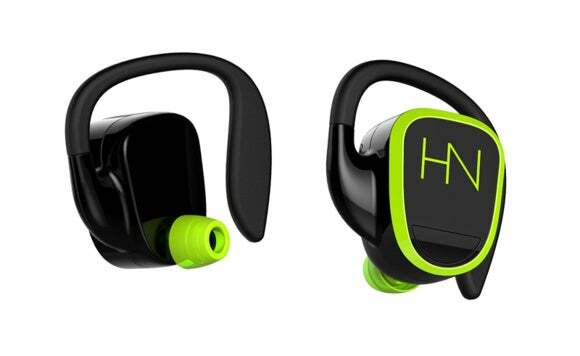 The black and neon-green earbuds are on the chunky side, and they have a rubbery hook that loops around your ear. But they’re surprisingly lightweight and of course there are no wires to drag them down. 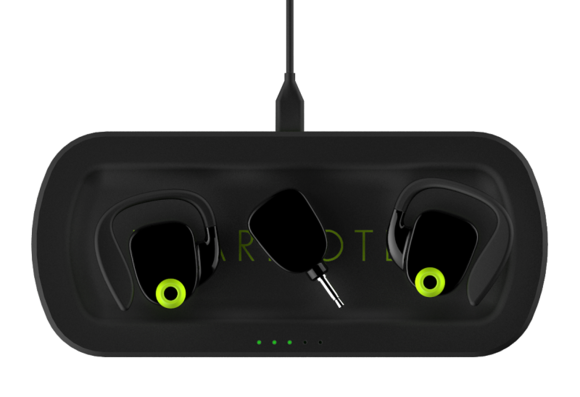 The HearNotes earbuds come with a case that doubles as a wireless inductive charging pad to recharge the batteries in the transmitter and the earbuds themsevles. The left and right components of these earbuds are completely separate wireless entities that pair to a transmitter you plug into your smartphone or media player’s headphone jack. And unlike lesser earbuds, the HearNotes don’t rely on Bluetooth. They use Kleer technology to get their sound across. The WireFree headphones come with an inductive charging case and will sell for $349 when they begin shipping later this quarter.